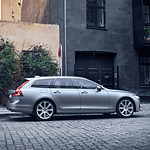 The Volvo V90 is a wagon designed to tackle a variety of driving and road conditions. To tailor its handling to road conditions and your driving style, Volvo provides a Drive Mode setting that includes Comfort, Off-Road, Eco, Individual, and Dynamic. Each mode sets the way the Volvo V90's suspension, transmission, and engine respond as you drive. The advanced Geartronic transmission features 8-speed, automatic shifting that ensures a smooth experience on different road surfaces and optimal fuel efficiency. If you prefer to have full control of a vehicle's gear shifting, you can switch to manual transmission mode for a more dynamic driving experience.